In this paper is presented Synthesis of a for-bar linkage mechanism of the lift car extrusion. In this mechanism are introduced even higher kinematic pairs. The movement of the mechanism is repeated periodically and it is sufficient to do its kinematic study for an angle 75 [deg]. The description of the mechanism movement can be performed in the grafoanalytical or analytical path by centers of speed moments, which belong to a narrow link and a loop of the center mechanism, and the instant centers belonging to the two related movements. In the kinematic analysis of the forward mechanisms are used graphical methods. These are simple and universal, making it possible to determine the positions, velocity and acceleration of the links of any structure. With the application of contemporary calculating technology, the graphical methods in the analysis of mechanisms take the right place. The velocity of each link of the mechanism linkage that performs the movement of the plane can be shown as very geometric of the instant center speed and the speed of rotation around the center of the instantaneous. The analysis will be performed by Math Cad software, while kinetostatic analysis will be carried out using Contour Method, comparing results of two different software‘s Math CAD and Working Model. The simulation parameters will be computed for all points of the contours of mechanism. For the simulations results we have use MathCad and Working Model software’s. Controlling the heat during cutting operations are an important factor in improving the quality of the product and performance of the machining. For controlling the heat, there are a lot of methods. One of this is Vortex Tube Cooling System. In this study, the Vortex tube cooling system was used to control heat during the turning operation. In the design of experiment, cutting speed, cooling temperature, feed rate, and cutting tool corner radius were selected as input parameters. Surface roughness and cutting force was selected as output parameters. The input and output parameters were modeled by using Artificial Neural Network, the results of experiment were optimized. The task of estimating the ranges of permissible changes in the design parameters of a chemical reactor is solved in which the stability property of the monomerization process is retained in it. The solution is based on Ji-guang Sun’s results about the perturbation of the spectrum of the matrix, the elements of which depend on several indeterminate parameters. 1. Identification of the most significant risks for petrochemical enterprises. 2. The formation of indicative indexes which will allow to identify symptoms of significant risks promptly. 3. Working out of reaction algorithm to risks’ signals in the petrochemical industry. Structural changes on the surface of R260Mn grade rails, developed during wheel/rail contact were investigated by optical microscopy, electron backscatter diffraction (EBSD), transmission Kikuchi diffraction (TKD) in scanning electron microscope (SEM) and transmission electron microscopy (TEM) The microstructures of the heavily deformed surface layer known as white etching layer (WEL) and the deformed under layer were characterized in different length scales. Ferrite grain fragmentations and grain alignment in normal direction, (perpendicular to traffic direction) are characterized by all applied methods. Substructures, having misorientations lower than 5°, are identified by analysing the local misorientation maps (kernel average misorientation (KAM)). Retained austenite was detected in the WEL by XRD, EBSD and TKD. Detection of retained austenite and ultrafine grain structure were considered as an indication for mixed mechanism of formation of the WEL where both martensitic transformation and severe plastic deformation take place. 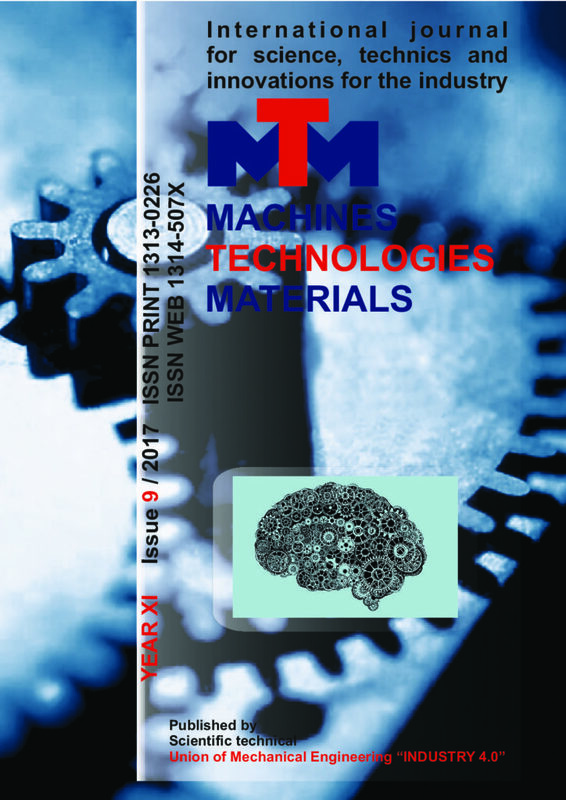 The paper presents standard statistical procedures for determining expert assessments for the influence of magnesium alloy components on the controlled mechanical properties: tensile strength and relative elongation. There are obtained neural models describing mechanical characteristics from the amount of aluminum, manganese, nickel, iron and silicon directly related to the exploitation properties of the product. The applied approach makes it possible to determine of compositions ensuring relatively optimal values of the explored quality indicators. The possibilities of Fe-Al intermetallic system production by vacuum sintering and impact consolidation of powder bodies, as well as the influence of the regimes of the methods used on the structure and properties of iron aluminides were studied in the article. Mixture of iron and aluminum powders were used for fabrication of iron aluminide Fe3Al. The powder samples were compacted and vacuum sintered at temperatures of 1250, 1350, 1400 and 1450 °C, and also using hot forging at a temperature of 1050 °C and 1150 °C. It is shown, that the increase of density is observed only at a temperature of 1400 °C. At sintering temperature of 1450 °C the samples reach a density of 6,35 g/cm3, which is 94% of the theoretical value. Only the use of hot forging makes it possible to obtain nonporous samples. It is shown, that bending strength, fracture toughness and hardness increase with increase of sintering temperature, but higher values of this parameters have the samples, produced with use of hot forging. In this research work were analyzed the reasons for fracture of pin machined from 42CrMo44 steel. One pine build in TBU (Tread Brake Unit) of railway wagon breaking system was broken in exploratory condition. Reclamation from purchaser was sent to the producer concerning occurred fracture of pin. Producer sent request to the team of the Faculty of Technology and Metallurgy to perform investigations and to determine the reason of fracture (failure analysis). It was decided to perform the following investigations: visual inspection, determination of chemical composition, hardness measurement, metallographic investigations which include analysis of microstructure and quantitate determination of nonmetallic inclusions. For comparison of results, raw material for pin production i.e. solid bars φ50, and new none used bar from the same steel was investigated too. Performed investigations showed that the main reason for the fracture of pin is the quality of the raw material more concretely segregation of chemical elements and increased concentration of nonmetallic inclusions.